It is certain that the barrel length is one of the most significant factors affecting the rifle's performance. It requires manufacturers to design the barrel with complete accuracy. The 6.5 Grendel is designed not only for precision shooting at both short ranges and long ranges but also to limit the weapon's recoil. To gain these goals, manufacturers must make barrels with the length to be harmonic with their characteristics. So what is 6.5 Grendel barrel length? Which is better and why? This article will solve all your questions. The lengths of 6.5 Grendel barrels typically fall between 10.5 inches and 24 inches. In detail, it includes sizes of 10.5 inches to 11 inches, 12 inches to 12.7 inches, 14.5 inches, 16 inches, 18 inches, 19.5 inches, 20 inches, 22 inches, and 24 inches. From them, the 6.5 Grendel 16″ size may be the best choice for this scope. 16″ and 18″ barrels are lightweight and have an excellent 1/7.5 twist rate. Thanks to these characteristics, it will offer the terminal effects and more extended range. Meanwhile, two sizes 20″ and 24″ are optimal choices for hunting. Shooters can also use shorter 6.5 Grendel barrels. They have a slightly lighter weight and useful silhouette but bring very low speeds. However, they are still excellent selections for normal firing or utility rifles. A 6.5 Grendel in 24″ size is a good match for almost hunting practices. It is believed to be the most flexible of the 6.5 Grendel barrel length. Also, this 6.5 Grendel barrel offers shooters a superb accuracy and maximum effective range up to 1,000 yards, even longer with the suitable ammo. The rifle's balance gives gunners the stability in almost firing positions. The included bipod is also useful. This barrel length is excellent for various firing tasks, including long-range varmint shooting. On the other hand, a 6.5 Grendel with the size of 20″ is not only shorter but also lighter than a 24″ rifle, making it a viable option in case you have to carry your weapon over a long distance. This barrel length is also very flexible and accurate, but it cannot give shooters some stability from a bipod like that of size 24″. Which 6.5 Grendel Should We Choose? The barrel length will directly affect the range you can reach. But all 6.5 Grendel barrel lengths provide different shooting range. Long barrels typically offer long ranges, and vice versa. So which 6.5 Grendel barrel length is optimal for long distance shooting? 6.5 Grendel in sizes from 18″ to 24″ seems more optimal as many weapon enthusiasts choose them. 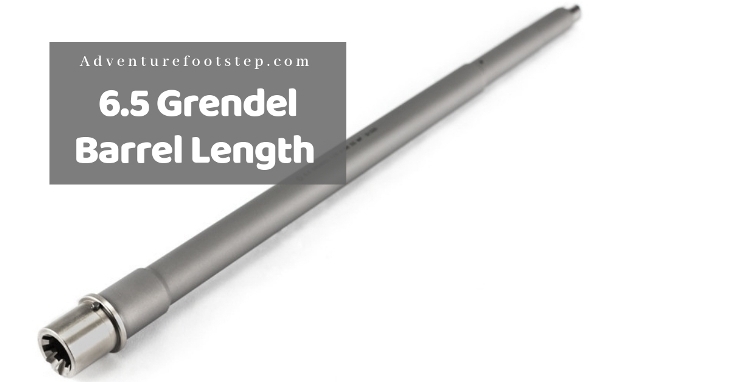 There are various 6.5 Grendel barrel lengths for you to choose, depending on your use and budget. However, if you own a 6.5 Grendel but the barrel length doesn't work well, you should consider adjusting or replacing it with a more suitable length. Trying a high-quality barrel will also help your weapon get the best shooting results. Do you want to read more information about the 6.5 Grendel? Visit our site more frequently!